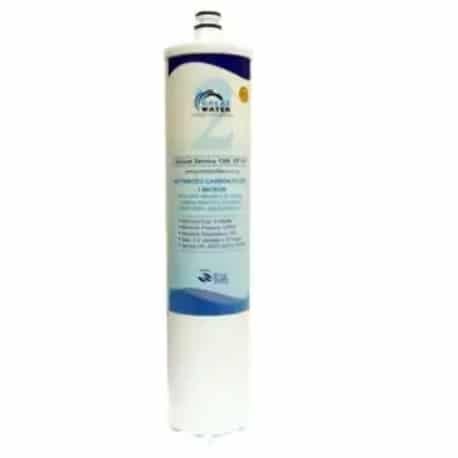 Chlorine Removal Cartridge, is the second stage of the basic under sink water filtration system, helps in removing chemicals like chlorine, removes odour from the water after completion of dirt removal in the first stage cartridge. Elite Series 1 is a 3 stage basic under water filter system, it has the benefits of 77% removal rate, easy fix or replacement cartridges and Stage 1, Stage 2, Stage 3 cartridge are the sanitary safe. This granular activated carbon cartridge has a 1 micron water filter. It is made from finest materials and is manufactured by a leading brand. It is the latest in water filtration technology. The granular activated carbon filter removes organic chemicals, such as chlorine, and microorganisms, such as Giardia and Cryptosporidium. To guarantee that your water filtration system produces fresh tasting and pure water, the filter should be replaced every 12 months. Under sink water Filter system (Elite Series 1) has the function of removing general corruptions from the raw tap water and also other under sink systems are available for fluoride removal, chlorine-free, returning minerals and filtered operations.